With their matching plaid-flannel shirts, suspenders, and full beards and mustaches, Jeffrey Costello and Robert Tagliapietra are unlikely advocates for femininity. Yet you'd be hard-pressed to describe their Spring/Summer 2012 lineup at New York Fashion Week on Friday any other way. Dresses of every description, clad in heady florals or lustrous solids, slinked across the runway. "We kept thinking of this one word; we kept thinking of 'romance," Tagliapietra tells Ecouterre. AirDye uses 90 percent less water and 85 percent less energy than conventional dyeing methods. Costello Tagliapietra, the duo says, is for "every woman, there isn't one specific type in mind." Particularly memorable are the vivid, saturated hues, a result of the digital technology they use. "It really comes from the AirDye process," Costello says. "We really play with the back colors as much as the front colors. That really pops the color a lot," he adds. AirDye uses 90 percent less water and 85 percent less energy than conventional dyeing methods, two characteristics that will factor increasingly in a thirsty, post-peak-oil world. 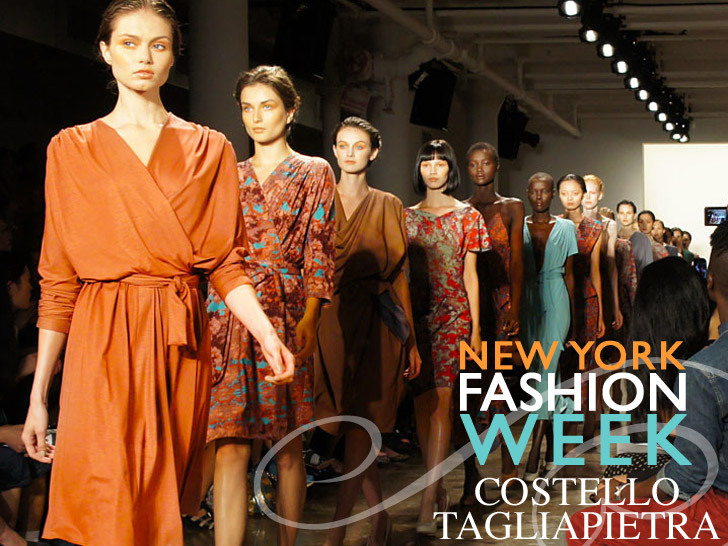 "We have to dye fabrics, so we chose to do it this way," Tagliapietra says. "It is saving water and it is saving energy. It is really a no-brainer for us." Despite being more sustainable than conventional dyeing methods, AirDye loses none of its pop or vibrance. Ultra-vivid solids and prints are possible through the magic of digital printing. In fact Costello and Tagliapietra couldn't have done it any other way, since their custom prints involved layering photos of gardens on top of each other. A quote by Georgia O’Keeffe about the beauty of flowers inspired the painterly florals. A familiar face in the crowd: Miss J. Alexander from TV's America's Next Top Model!